I cannot take any credit for this recipe except for typing it out! Many of you ask me for healthy, low calorie recipes and frankly i do not use much oil in my cooking except when i deep fry. This is part of my daughter Chaya´s diet. My daughter does not “diet”, she just eats healthy where her meals are concerned because she has a weakness for sweets, cakes, cookies etc, so her meals are always light but her desserts decadent 🙂 She cooks her spinach this way and loves it. Its a simple recipe with few ingredients and no spices. It takes hardly any time to cook and can be made in quantity and then refrigerated and added to pasta or salads. Heat a good non stick pan till well heated. I used my cook n serve ceramic pans. Add the olive oil and then the garlic and the red chilli and sautee till the garlic starts changing colour and gets fragrant (please take care not to burn or else the dish will taste bitter). Add the spinach leaves and cook on a high heat till they are cooked (it will only take you a minute) and then add the salt. Take off heat and serve in the same pan. Please do not overcook as the spinach will lose all its nutritional properties. 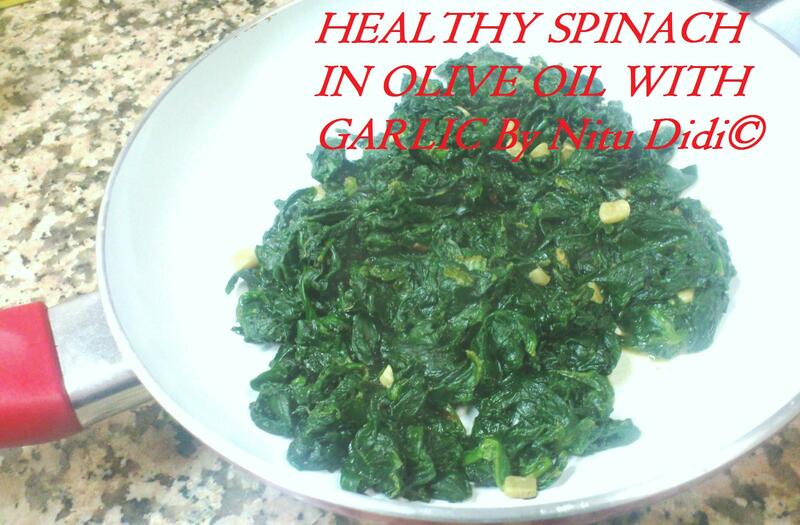 Tbis recipe can be made with any kind of leafy green vegetable. Olive oil is very good for health. It has many benefits and cardiologists recommend a daily intake of 2 tablespoons. This can be easily had by dressing your salads with olive oil and stir frying your vegetables in it. This entry was posted in Everything Vegetarian, Gluten Free, Healthy Options, Low Cost, Quick Recipes, Veg Starters, Vegan and tagged garlic, healthy, low calorie, olive oil, spinach. Bookmark the permalink.